CBI Roundup was a free newspaper published by and for the men of the United States Forces in the China-Burma-India Theater of World War II. Captain Fred Eldridge, a former reporter for the Los Angeles Times and Public Relations officer on General Stilwell's staff, was founder and first editor. The first issue of Roundup was published on September 17, 1942. Over the following three and one-half years, a total of 188 issues were published, culminating with The Last Roundup, on April 11, 1946. A smaller newspaper, Chota Roundup, continued until the end of Theater operations. Content for the weekly newspaper came from news and pictures supplied by staff members, soldier correspondents, professional news agencies and Army and War Department news services. Roundup was widely recognized as one of the best soldier-written newspapers of World War II. The paper was printed by The Statesman in New Delhi, India and later also in Calcutta, India. It was distributed by all means possible throughout the CBI Theater, one issue for every two soldiers. Beginning with the February 1, 1945 edition, the paper was renamed India-Burma Theater Roundup as a result of the CBI Theater being split in two in late 1944. Roundup continued as the newspaper of the India-Burma Theater while The China Lantern eventually became theater newspaper for the China Theater. In the menu are issues of Roundup, recreated for the Internet, using the original stories and pictures. 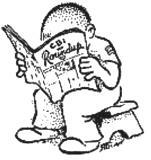 The history of CBI - written as it happened. Click on a date to view that issue of the Roundup. Use the scroll bar to view additional selections, including some other G.I. newspapers.